Enterprise customers are often surprised to learn that Google Cloud Platform is a great environment to run their Windows workloads. Thanks to GCP’s dramatic price-to-performance advantages, customizable virtual machines and state-of-the-art networking and security, customers can migrate key workloads, retire legacy hardware and focus on building and running great applications rather than on maintaining costly infrastructure. Google Compute Engine on GCP has key advantages for running SQL Server. Custom Machine Types let you tailor CPU core and memory configurations on VMs, allowing enterprises to fine-tune configurations that can reduce the licensing cost of running Microsoft SQL Server compared to other cloud environments. Add in automatic sustained use discounts, including the long-term prospect of retiring hardware and associated maintenance, and customers can arrive at total costs lower than many other cloud alternatives. Regarding speed, Compute Engine VMs’ fast startup times shorten the time it takes to boot up operating systems, and Windows is no exception. On the I/O front, standard and solid-state persistent disks associated with Microsoft SQL Server VMs deliver a blazing 20,000 IOPS on 16-core machines and up to 25,000 IOPS on 32-core machines — at no additional cost. Compute Engine VMs preinstalled with Microsoft SQL Server allow customers to spin up new databases on-demand without the need to purchase licenses separately. Enterprise customers can pay for premium software the same way they pay for cloud infrastructure: pay as you go, only for what you use. For customers with Software Assurance from Microsoft, your existing Microsoft SQL Server licenses transfer directly to GCP. In addition, support is available to customers from both Microsoft and from Google. Learn more on our web page. It’s easy to get started with $300 in free trial credit using any of our supported versions of Microsoft SQL Server. 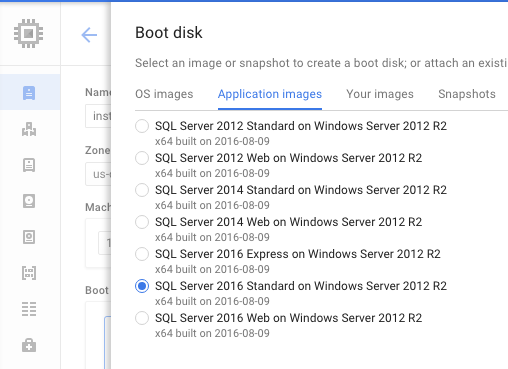 Create a boot disk from ready-to-deploy images directly from the Cloud Console. Here’s detailed documentation around how to create Microsoft Windows Server and SQL Server instances on GCP. Customers can get help today with a range of partner-led and self-service migration options. For instance, our partner CloudEndure replicates Windows and Linux machines at the block level, so that all of your apps, data and configuration come along with your migration. Contact the GCP team for a consultation around your Windows and enterprise workloads. Our team is committed to helping support your workloads today, paving the way to build what’s next tomorrow. 1 HTML Element + 5 CSS Properties = Magic!